Subedan Bibi’s mud hut is a few metres from the banks of the Bakchara river, a distributary of the Hugli in Sunderbans region of South 24 Parganas. When the river is in spate she and most others of Goyadham village move to the main market in the nearby block. “Floods and storms destroy everything, even the grains that we store at home. During these times, we have to do something to ensure that our children do not go hungry,” says the 45-year-old. In September 2013, seven of the 11 members of West Bengal-based Ma Ameena self-help group (SHG), of which Subedan is a member, set up a community grain bank, or grain gola. The cylindrical structure is made of straw ropes, cement, mud or bamboo, and stands on stilts to safeguard against pest attacks and floodwater. It is built and maintained by the SHG members, and has become central to food security. Individual grain gola is not a new concept. Farmers have been storing grains at home in similar structures. But community grain bank is gaining popularity now, especially among the landless agriculture labourers. In most villages of the Sunderbans region, there is no agricultural work from September to November and from March to May. “Families like ours which depend on agricultural work, stare at abject poverty during these times,” says Manuara Bibi, who is in her 30s. “The only option then is to take loan at exorbitant interest rates from local moneylenders. Grain banks ensure food to our children”. The women of Goyadham earn their livelihood by selling bamboo mats and working under the Mahatma Gandhi National Rural Employment Guarantee Scheme. Some have started small organic kitchen gardens for a constant supply of vegetables and greens. The men usually migrate to other cities for work. The SHG members have now dug a pond where men can do fishing and supplement their families’ income. In 1996, the Ministry of Tribal Affairs launched Village Grain Bank Scheme to provide foodgrains to people living in chronically food deficit areas. According to the scheme, village panchayat, SHGs and non-profits identified by the state government can run the grain banks. The scheme was shifted to the Ministry of Consumer Affairs, Food and Public Distribution in 2004. The government claims to have spent Rs 10.26 crore on 4,858 grain banks between 1996 and 2005 in 11 states. However, in Sunderbans the grain banks are either owned by individuals or are assisted by local non-profits. “A grain bank is key to food security for small and marginal farmers, and landless labourers. In West Bengal, 93 per cent of the land holdings are small,” says Raj Krishna Mukherjee of Development Research Communications and Service Centre (DRCSC). The non-profit has been instrumental in setting up grain banks across the state. 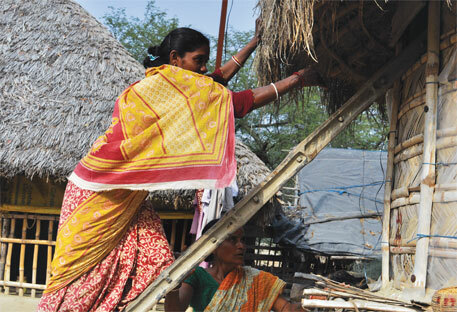 In the last 10 years, DRCSC has supported 225 grain banks with 2,400 households as members. In Sunderbans region (both North and South 24 Parganas), it has helped set up about 50 grain banks. The economically poorest get priority for enrollment as members of the grain bank. Soon after the harvest, the members deposit equal amounts of paddy. Those like Subedan and Manuara, who do not have land, buy paddy from the open market when it comes cheap to deposit at the bank. The seven members of Ma Ameena SHG deposit 56 kg each. DRCSC, which supports the SHG in this case, contributes as much as the total paddy deposited by members. This helps buttress the bank’s stock. The grains are stored and drawn during off-season when the market rate is steep. Each time paddy is drawn, the member returns the stock with 10 per cent interest within a stipulated time. So for every 100 kg drawn, 110 kg is returned. The interest helps the stock grow. “If there is any violation, we first request the members to return stock. If they still don’t, we go to the panchayat,” says Subedan. Foodgrains are available to non-members if the members agree to it, and at 15-20 per cent interest rate. The grant that the non-profit provides to the bank is returned after three years. This is used as revolving fund to start more such banks in the vicinity. In the Sunderbans region of North 24 Parganas, an SHG of the tribal community is working towards putting grain banks to entrepreneurial use. 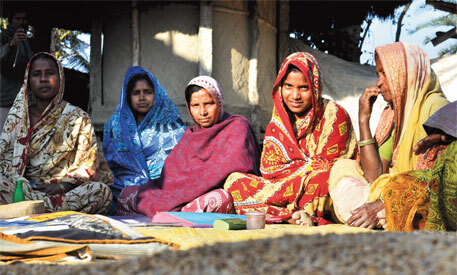 After Aila in 2009, farmers of Nebukhali village were forced to migrate. At least two to three members from each family went to states as far as Tamil Nadu. The cyclone had increased the salinity of the soil making it impossible to grow paddy. The farmers returned after a year or so and have managed to do organic farming, though they still cannot match the earlier scale. But what’s more important is they no longer go to the moneylender or mortgage their assets to feed their families. Preetilata Mahila Samiti, SHG at Nebukhali in North 24 Parganas, set up a grain bank in 2012-end. The SHG comprises 13 women from the Munda community and two from the Scheduled Caste. They purchased grains from the market and deposited them in the bank because the paddy they grow is not enough, says Anjali Munda, a member. The SHG’S aim is to increase grain stock and at the same time raise funds for the bank. “From this year, we have decided to convert some part of the paddy to rice and sell it in the open market. We will keep the rest for the SHG members to withdraw during times of crisis,” says Binota Munda, another member. The SHG is convinced that the business model will work. “We will use the money that we get from selling rice to buy more paddy,” says Kalyani Borkandas as she dries paddy to convert it to rice. Kalyani is a non-Munda member of the Preetilata Mahila Samiti. “The bank has given us immense food security. Earlier, shortage periods stretched for three to four months. Now it has reduced to a few weeks. It will get better now,” she says. Though migrations have not stopped, they have certainly reduced. There are about 330 families in the village, majority of them small landholders. Binota’s husband Ajit works as a construction labourer in Tamil Nadu and would earlier stay away for almost the entire year. In the last few years, he has gone for only a few months in between two crop cycles. Anjali’s husband was a migrant labourer. Now he stays in the village and has resumed farming. With support of non-profits, the SHG women have started rearing goats, pigs and poultry besides growing vegetables in their small kitchen gardens. They sell vegetables only after they have met their own requirements. Members of the SHG are very vocal about the government’s food security bill and free food to the poorest of the poor. “All of that is fine. But the government’s doles are not regular. The banks give us surety of foodgrains when we need them. Had the government been regular, we would have saved money to send our children to better schools and colleges,” says Binota, who pays Rs 800 tuition fee for her two children. A very innovative and indigenous way of food grains preservation. Will Technologists study this and adopt it?